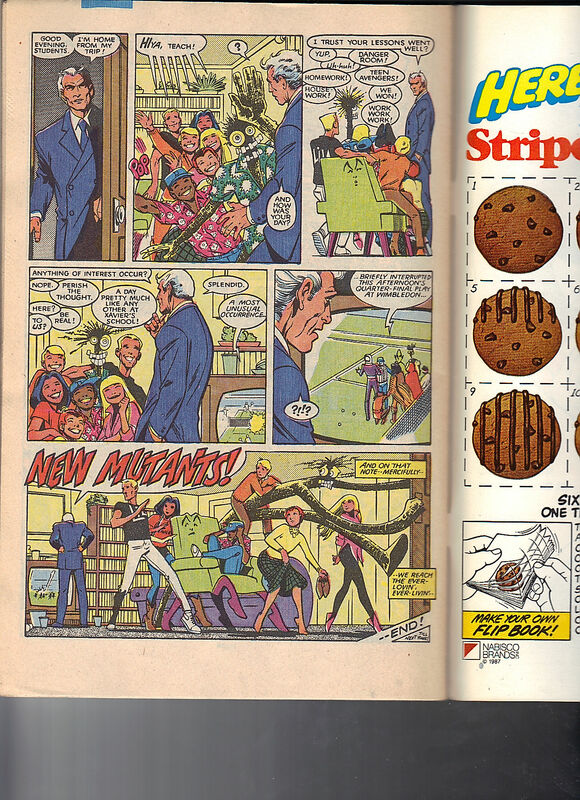 Issue opens with Doug Ramsey, drawn amazingly by Davis and Neary. Doug is listening to a wide range of music, he sets up a new Danger Room session. Illyana doesn’t hide the fact that she’s bored by how long Doug is taking to get the session started. 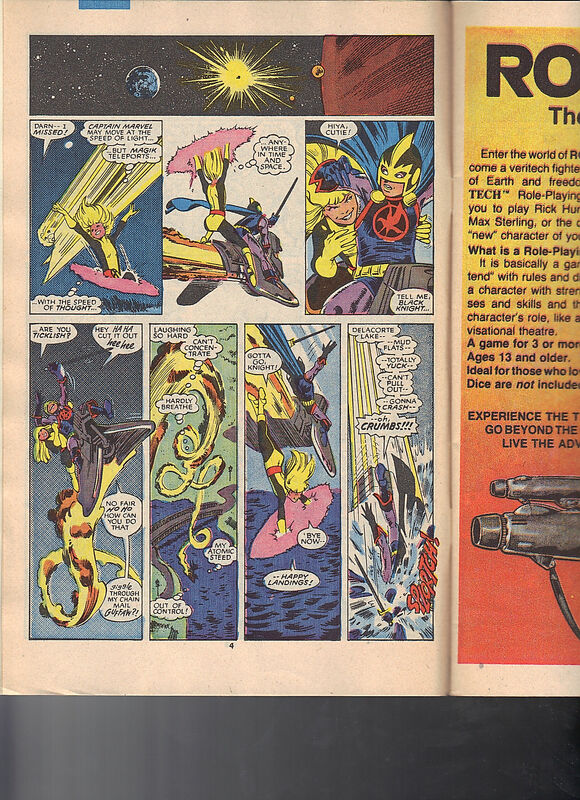 This issue takes place after issues 47 – 51, I own all but issue 49 – no Magik so I don’t own it. We know this as Magma and Karma are not part of the training session due to being sick. Dani is sick but as the leader of the team, she had to be present. Doug starts the training season, Illyana is surprised they are in Central Park whereas Sam is more surprised Doug is having them fight the Avengers. Who are Captain America, Thor, She-Hulk, Monica Captain Marvel, Black Knight and Dr. Druid. I take it, these must be the current Avengers but f you were going to program “The Avengers” you’ll go with the all stars, right? 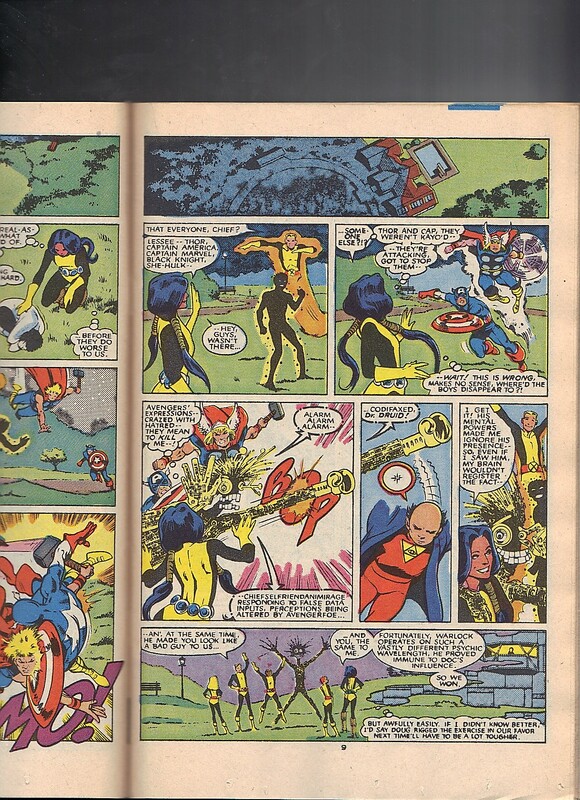 Sunspot references New Mutants 40 and Avengers v X-Men, in that the Avengers are no friends to the Xavier School. 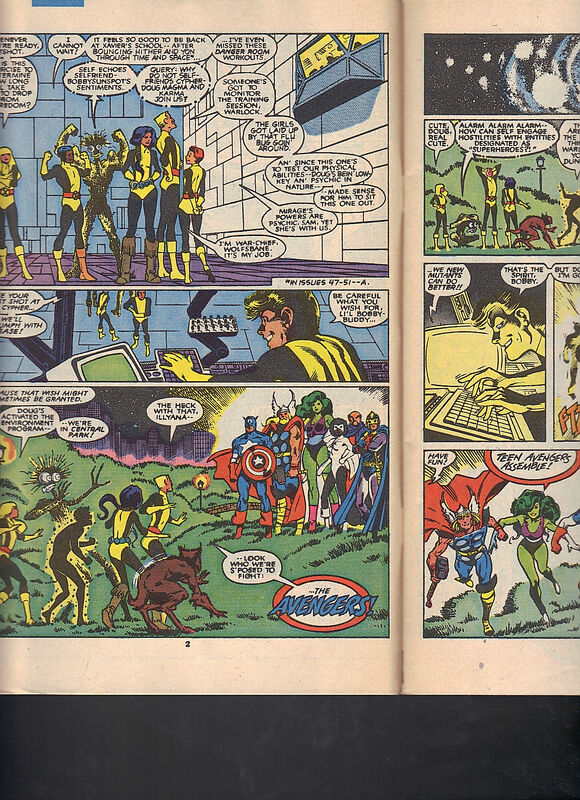 To even the odds, Doug presses some keys and the Avengers turn into, The Teen Avengers! 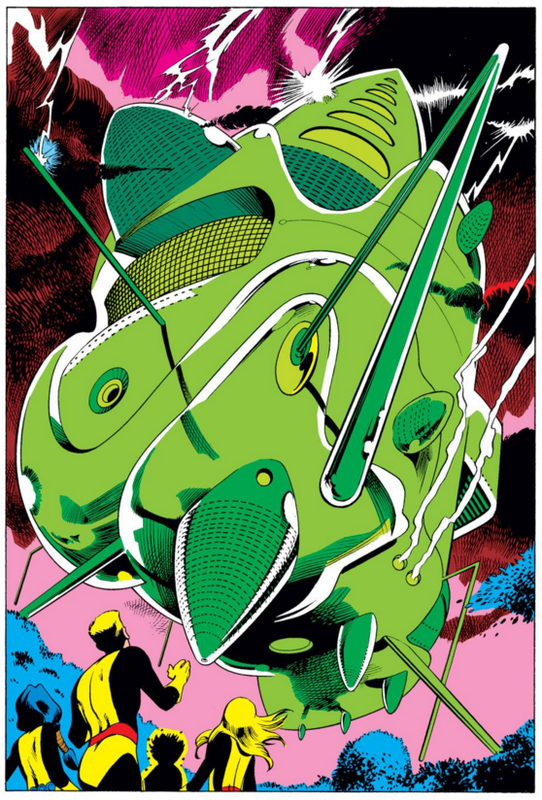 Davis / Neary are such a great art team, they manage to actually deage the Avengers but also keep them recognizable. Magik takes on Black Knight but it doesn’t break out into a sword fight like I thought it would. I do like how she simply dodges Captain Marvel. Sunspot fights She-Hulk, and abuses the Danger Room policy by taking the time to kiss She-Hulk. That’s not using the hardlight constructs correctly! Captain America defeats Wolfsbane but Cannonball is able to knock him off of his feet. Captain Marvel knocks Sam back though. As Sam continues to fall, Thor catches him. Captain Marvel is caught off guard by seeing a giant monster in the sky. This was her childhood boogey-man so Dani just took her out. As Thor is about to land, Cannonball blasts away and throws Thor into Sunspot. Sunspot catches Thor and flings him towards Captain America. In front of Dani, Sam and Sunspot turn into Thor and Captain America. She was doing a head count and had forgotten an Avenger. She, like me and history, had forgotten about Doctor Druid. 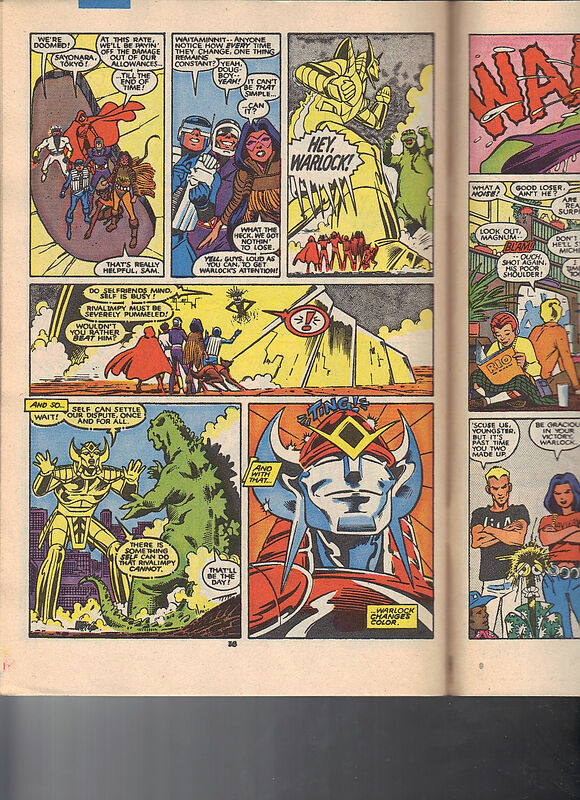 Good thing Warlock, who also disappeared, is on set to take out the Sorcerer Unsupreme. 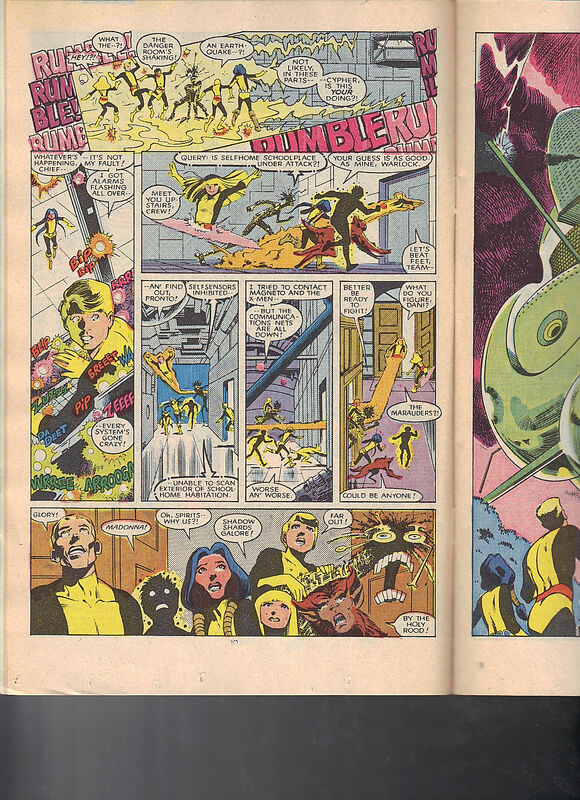 The New Mutants are impress they won over the Avengers but Dani feels like it was too easy. Which it was, once they were turned into teenagers. An earthquake triggers the Danger Room to go to its default setting. 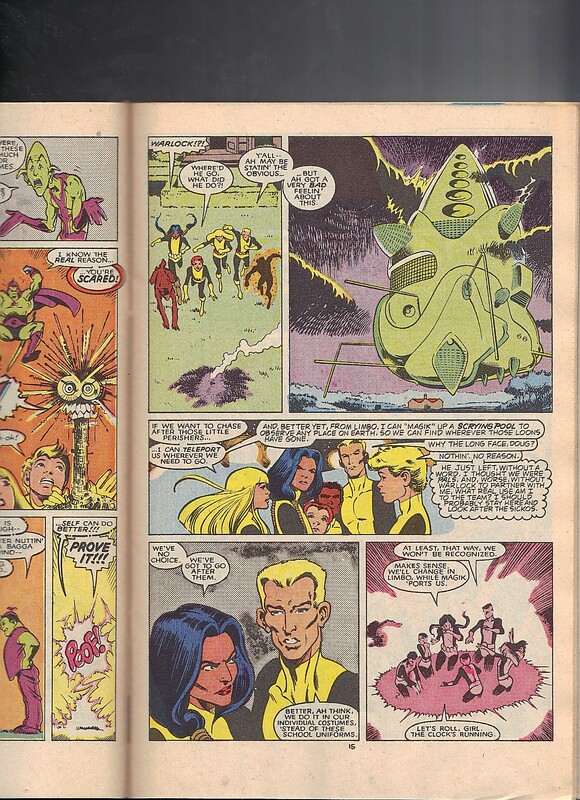 Communication is down, so the team can’t contact Magneto & X-Men, a line of dialogue that is constantly needed to explain why the older class-men are not involved in the high jinks. They see a giant green ship! Out of the ship comes . . . Impossible Man! This is a sequel to Uncanny X-Men Annual 7. Dani comes at Impossible Man, as she isn’t up for any nonsense. Illyana starts trying to subtly nudge Dani to calm down. Illyana wants Dani to watch her tone as Impossible Man has untold powers – including the ability to take the mansion out of the ground. Sam and Sunspot can’t believe that the Scavenger Hunt story was real. Impossible Man enjoys the story and uses his shape-shifting power to retell it. He took Nick Fury’s eyepatch, he took both Black Queen’s and Wasp’s costumes, Iron Man’s original gray armor and Hulk’s purple pants, he took captive Zabu, the Sabertooth Tiger, Doctor Strange’s skylight and the Fantasticar. He has returned so that he can continue the good times. 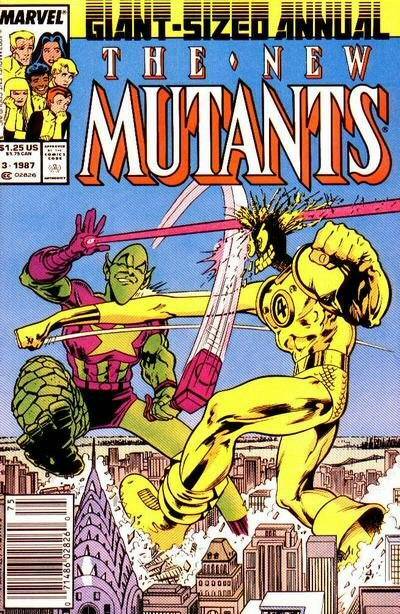 The New Mutants walk away, they don’t have time for these games. Impossible Man thinks they are scared and like Marty McFly, Warlock doesn’t like the idea of being called a chicken. Warlock v Impossible Man, is a fun match up, does it need to be a giant sized annual? I’m not so sure but this issue is gong to get pretty big. Magik has a plan, she can teleport them to wherever the duo goes. From Limbo, she can create a scrying pool to keep an eye on the shape shifters. Doug doesn’t like that Warlock left, as now he doesn’t have much to offer the team. 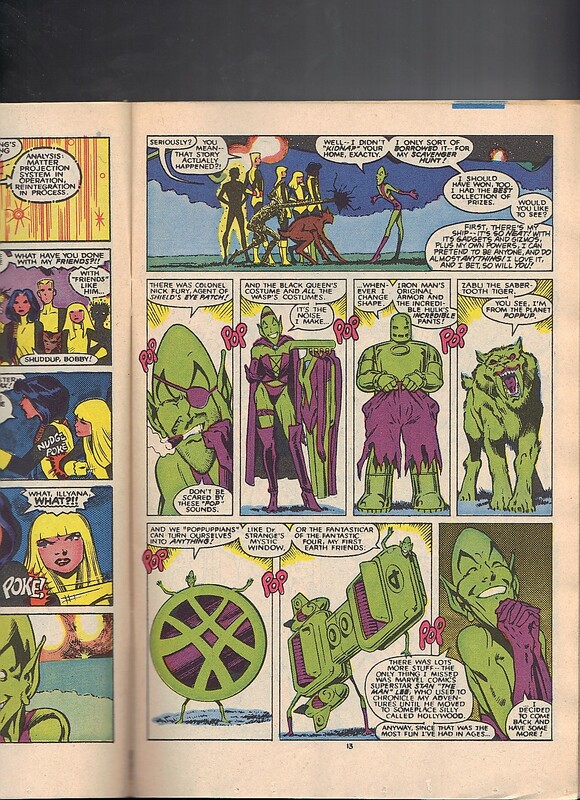 Dani agrees with Illyana’s plan, Sam adds that they should use their graduation outfits. Last (and first) seen in Uncanny X-Men Annual 10, so this could be three years since Impossible Man’s last visit. Art Adams originally drew them but Davis / Neary get a shot to bring them back. I still think Magik’s is probably the best, the others seem to be something Xavier half designed. 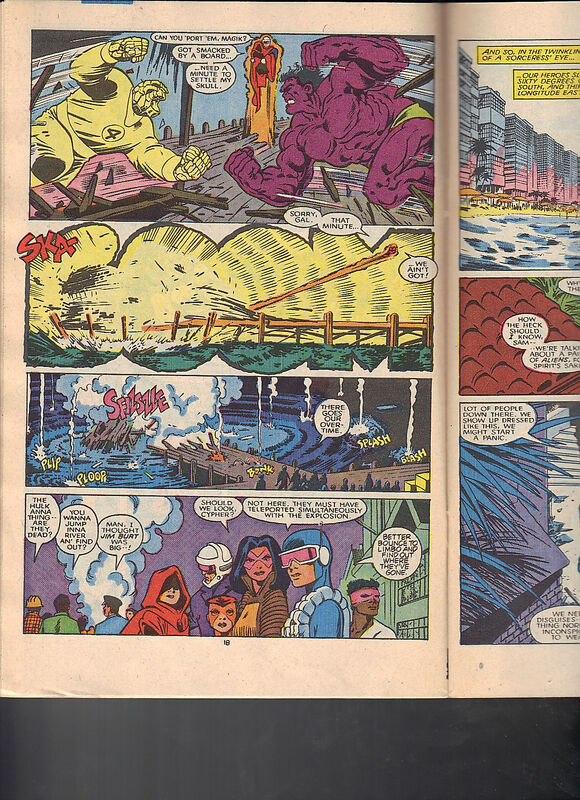 At the Hudson River Towers, Hulk (Impossible Man) is fighting Thing (Warlock). The team tries to calm the civilians. Magik tries to teleport the two to limbo but the floor falls apart out from under her. Before she can fall into the river, Cannonball saves her. I like do like how Warlock sticks to his yellow and black color scheme whereas Impossible Man is stuck having to stay green and purple. With a giant explosion, the combatants teleport away. Doug recommends they go back to Limbo and relocate them. The team is now in Sunspot’s home city, Rio de Janiero. 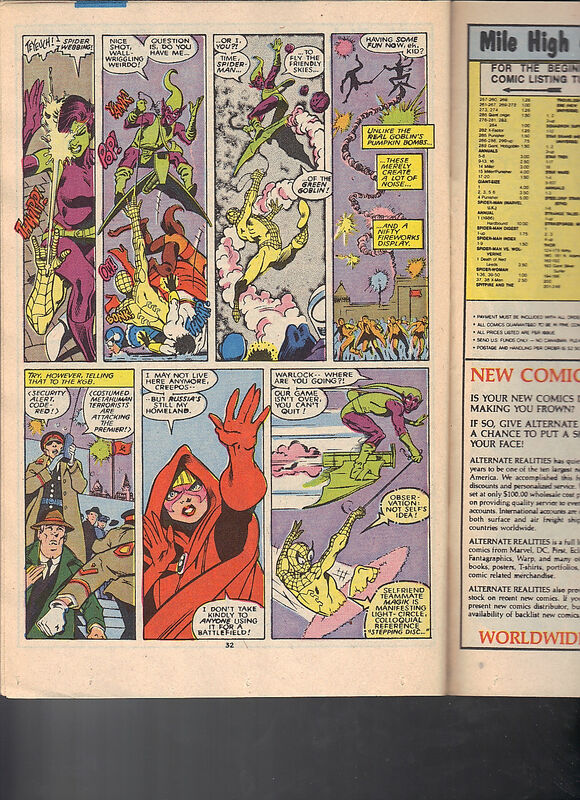 I like them pointing out that Warlock and Impossible Man are both aliens, so there is a disconnect there. Doug is worried that their costumes might start a panic. Sunspot has a solution to that and runs off. So I can only imagine Sunspot picked out everyone’s swimsuits. Nice of him to give Rahne a shirt, even though she still feels like she is revealing too much. Him giving Dani a one piece and Illyana a bikini, I think, speaks volumes. Doug is worried that someone might notice how tight his swimsuit is. Doesn’t help that Dani and Illyana are flaunting their goods. Wolfsbane picks up on a scent take takes off. Dani isn’t happy that all the women in Brazil are attractive. None of the guys try to score easy points by telling her that she is also attractive. Rahne shifts back and everyone catches up to her. She is shocked to see an almost naked man standing and flexing his muscles. Dani also likes what she is seeing. The two muscle men are actually the two aliens. Impossible Man is in body paint. Everyone is enjoying the show, maybe too much. 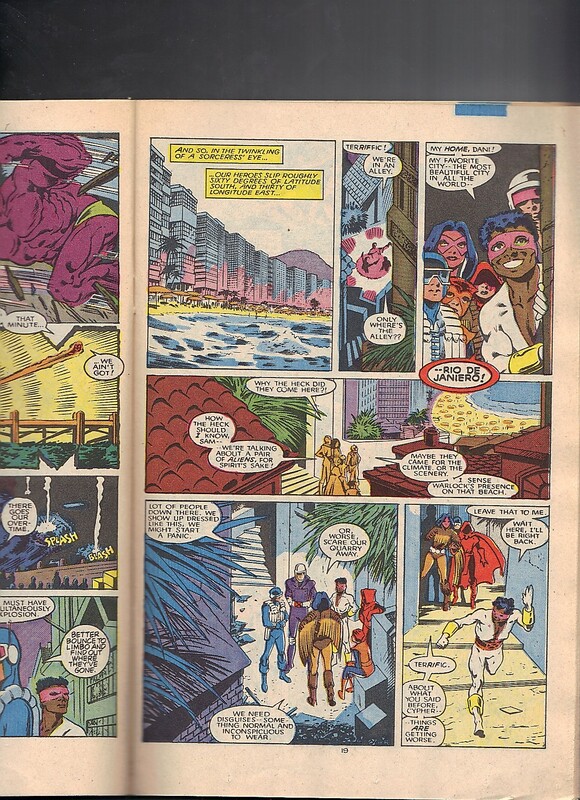 Cannonball knocks the two into the water and the water short-circuits Warlock and has Impossible Man’s makeup fade away. The women of the audience don’t like being tricked by the two guys and start throwing items at them. They disappear again. 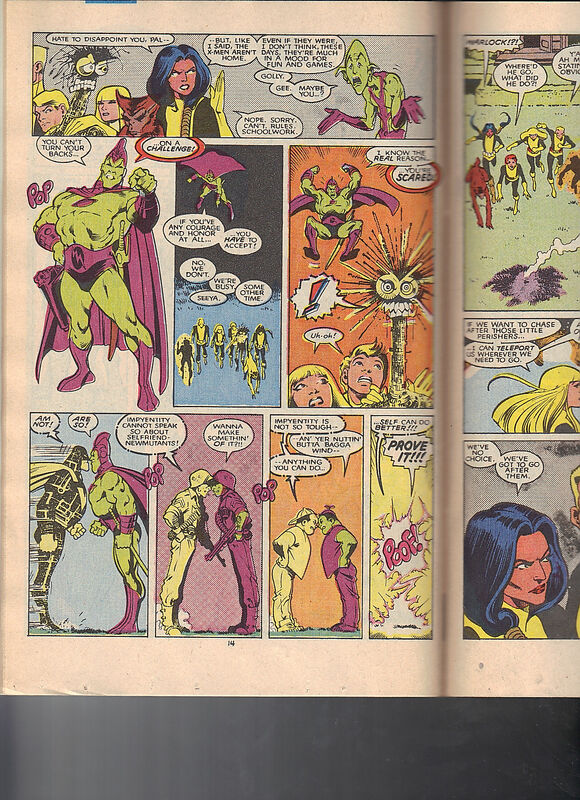 Illyana teleports the team away. In London, the duo are having a tennis match. 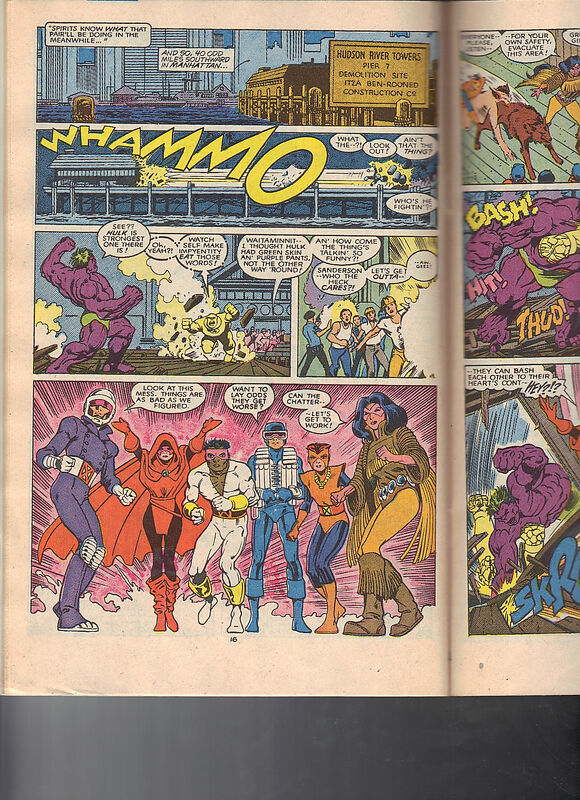 The duo move on and Claremont sneaks in Warlock as Captain Britain and Impy is Captain America. When the boys of the team arrive, Impy turns into Magneto and Warlock takes Xavier’s form. The aliens just want to continue their fun. The two are continuing their fighting. Impy turns into Viper and Warlock is Spider-Woman. So naturally, Warlock turns into Spider-Man and Impy becomes the Green Goblin. They’re in Russia now, so the KGB are trying to shut the fight down. Illyana doesn’t live here anymore but she doesn’t want her homeland to be trashed. Magik teleports Warlock to Limbo and yells at him. Cannonball has a chat with A Thanos inspired Impossible Man. Warlock comes back, now looking like male Captain Marvel taking on old foe, Thanos. 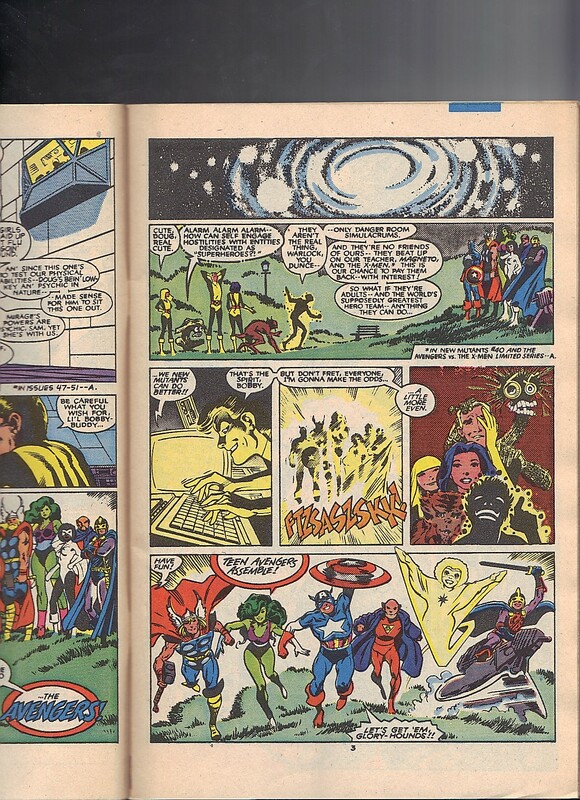 The two keep escalating, Warlock turns into Watcher and Impy is Galactus. We are treating to Warlock as Red Ronin and Impossible Man is Godzilla. The team finally tells Warlock to stop matching Impossible Man and beat him at something he can’t do. With that, Warlock goes from yellow and black, to multiple colors. Magneto comes home, finally. The students start talking over themselves, trying to hide what they’ve been doing. Impossible Man is in a shape of a chair. The television is on and coverage of the tennis game comes on and Magneto yells at the students. Back cover ad is for the Peter Parker and Mary Jane Watson wedding! Amazing Spider-Man Annual 21, and a special look at their relationship in Marvel Saga 22.